Palm has officially announced the release of the beta for its webOS 2.0 SDK, which means we are getting closer to the inevitable public release for supported devices. Starting tomorrow, the wide group of devs will get access to the latest SDK, which brings a number of new features to the operating system that will certainly give devs more power to implement them into apps. 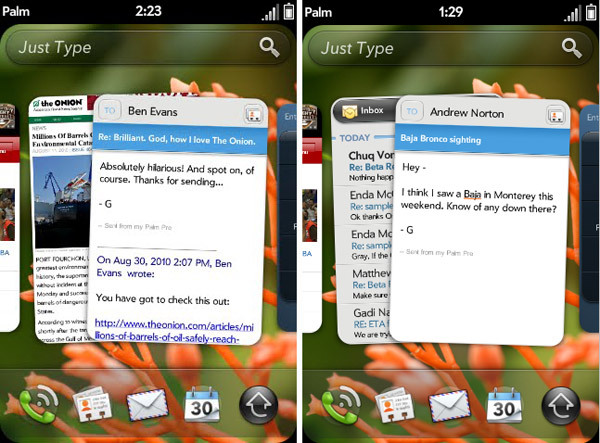 Among the new features is “Stacks”, which brings what Palm calls “true multitasking” to webOS. This UI of this feature utilizes stacks of cards in order to group together windows that are part of a single workflow. They can be managed through drag and drop manually, but will be organized automatically otherwise. Other features in the latest release include “Just Type”, which is a renamed Universal Search and provides more powerful search options, and “Synergy” improvements will give devs the ability to create address books and have more control over Synergy powered apps.